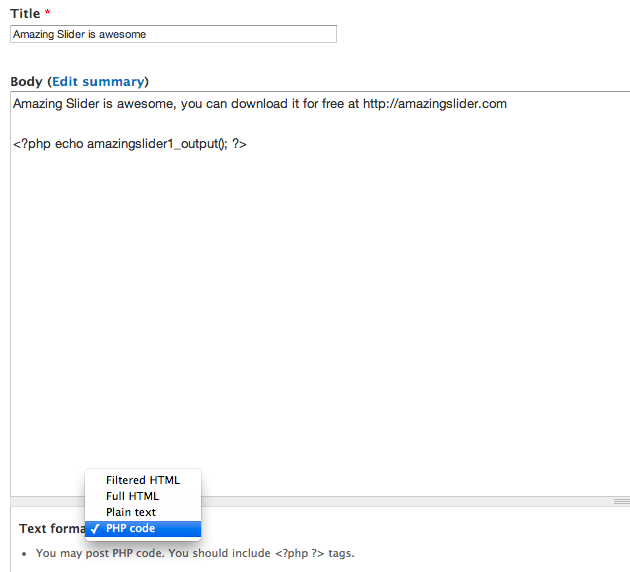 In Amazing Slider, you can publish the created jQuery slider to a Drupal 6 or Drupal 7 module. Login the administration area of your Drupal website, click Modules from the top menu, then click the link Install new module. Select the file created in step 1, click Install. If the installation is installed successfully, go back to the Modules page, check the ENABLED option of the Amazing Slider module, and click the button Save Configuration. To insert the slider to your Drupal page or article, in the Dashboard, click Modules from the top menu, then enable "PHP filter" module. Then in the page editor, find the dropbox menu "Text format" and change its value to "PHP code".